Is Equine Infectious Anemia Rearing Its Ugly Head in Your Area? One of our customers who purchased an H-Trap Professional Horse Fly Control System told us how he discovered our new horse fly trap and why he bought our equine fly control product. It turns out that the disease called Equine Infectious Anemia (EIA) had made news near where he lives in Cortland County, NY, and our customer’s vet was alerting its equine clients about recent cases and the best ways to protect their horses. Our customer was taking proactive measures to protect his horse from a disease that attacks a horse’s immune system. Here’s what we know so far, and why we think you should consider trying out one of our horse fly traps. On March 4, 2016, the New York State Department of Agriculture and Markets, Division of Animal Industry confirmed that five horses on a farm in Courtland County had tested positive for EIA, and had to be quarantined along with the other 5 draft and buggy horses that board there. After a five month investigation, the exposed horses tested negative and the farm was released from quarantine. Throughout the U.S., 52 horses tested positive for EIA on 36 farms. On April 18th, a horse testing positive on a farm in Halifax, PA was the cause of a quarantine of the entire farm by the Pennsylvania Department of Agriculture. It was even scarier to hear that this particular horse had a routine health check less than a week after it moved from another barn elsewhere in the same county of Dauphin. As part of the quarantine order, 19 other horses at the farm were quarantined. To assess all current disease outbreaks throughout the U.S., you can visit http://www.equinediseasecc.org/alerts/outbreaks?page=1. New York and Pennsylvania are not alone about following stringent rules of quarantine when a horse tests positive for EIA; each state in our country has laws and regulations for this disease. What is truly alarming about these positive outbreaks close to home in 2016 are that none were reported in any of these states for some time. Since 2007, the United States Department of Agriculture (USDA) has kept annual records and case summaries. To review the most recent report published in 2016, visit https://www.aphis.usda.gov/animal_health/downloads/animal_diseases/2016_eia_annual_final.pdf. In February 2017, the USDA released its third equine study in 17 years. The https://www.aphis.usda.gov/animal_health/nahms/equine/downloads/equine15/Eq2015_Rept1.pdf. Unfortunately, there is no cure or vaccine for EIA, which is also known as swamp fever. It is a virus transmitted through the blood by biting insects such as horse flies and deer flies. The EIA virus belongs to the family Retroviridae, which is a group of viruses that includes human immunodeficiency virus (HIV). EIA affects horses, and other equidae (donkeys, mules, and zebras). 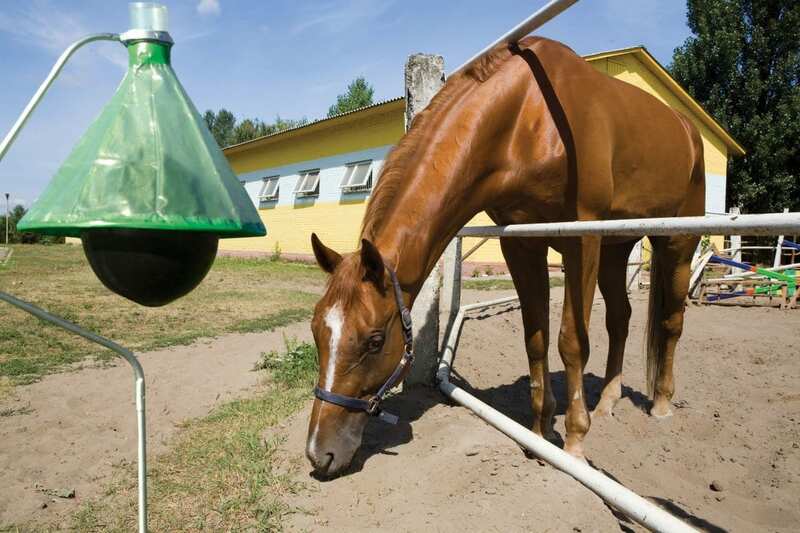 Once infected, a horse will be infected for life, and could potentially affect other horses at the boarding facility it resides or during transit to other states. Humans are immune from this virus. The disease occurs anywhere biting horse flies and deer flies hover. The cycle of transmission can begin when a female horse fly or deer fly, looking for a blood meal to reproduce, bites an infected horse and then bites a healthy horse. The virus apparently does not live for very long on the horse fly (according to the literature, anywhere from 15 minutes to 4 hours). So for one horse to infect another they must be close to each other in order for the infecting horse fly to move from horse to horse by a flick or twitch by the animal. Pregnant mares may pass the virus to their foals either in utero or through the milk. Stallions can infect mares during breeding. In addition, the disease can be introduced by the use of blood contamination through unsterile syringes, needles, surgical instruments, and dental equipment. The strength of the virus varies. A horse with a severe or acute case of EIA could die within a few weeks. This is rare, however. Signs could be little bruises on the mucous membranes, depression, lethargy, weight loss, edema, and anemia; sometimes there are no signs at all. Less severe or chronic cases will have very low levels of the virus and are unlikely to spread. Most horses, who are found positive for EPA, are inapparent carriers; they do not show any obvious clinical abnormalities due to the infection. Their blood, however, can carry the virus and can infect other resident horses. Stress, hard exercise (such as racing), transport, or illness due to other causes can strengthen the amount of virus in the blood, and therefore increase the chances of an acute form of this deadly illness. To know whether your horse is harboring EIA, you can ask your vet to perform a simple blood test called the Coggins test, named after the veterinarian who designed it in 1972. Once drawn, the blood samples are sent and checked for EIA antibodies in the horse’s blood to an USDA approved laboratory. This test and a negative result is required to take your horse across state lines, and is often needed to board horses and to bring your horses to fairs, competitions, etc. A negative Coggins test is proof to others your horse is safe to be around other horses. Some states now require a negative Coggins test on a horse before he can be sold. Some hospitals are also redefining the rules. Since the outbreak in Courtland County in March, for example, the Cornell University Veterinary Hospital is now requiring that a horse owner show negative Coggins test within six month of admission. Before travelling, check to see how recent a test is required since testing differs from place to place. Many conscientious horse owners will do annual tests because even if their horse has not left the property, it could come into contact with those that are visiting. What are your options when your horse receives a positive test? Demand a re-test promptly. If the test is still positive, your legal choices are euthanasia, sale for immediate slaughter, or lifetime quarantine. The latter usually requires that the horse is kept 200 to 300 yards away from another horse and identified with a tattoo, brand, or microchip. Apparently, many horse owners who have initially opted for quarantine later choose the other two options. Here are the best ways we have heard that can prevent EIA and its transmission through infected horse flies and unsterile instruments. Practice good horse fly control. Purchase horse fly trap products like the H-Trap Professional Horse Fly Control System and set them up where horses congregate at your farm. For trial riding and other events, use fly sprays. Regularly muck your stalls and properly dispose of manure away from horse stabling areas. Use a sterile needle and syringe for all injections or treatments. Thoroughly disinfect any surgical or dental equipment used between horses. Before disinfection, remove all debris and blood with soap and water. Only administer commercially licensed blood products. Use a sterile needle each time you puncture a multi-dose medication bottle. Consult a veterinarian to demonstrate how to use sterile techniques when drawing up medications. Require proof of a recent negative Coggins test when purchasing a horse or for new horses entering the premises. Require an EIA test for horses that have spent time at a premise where EIA-positive horses have been identified. Only participate in events that require evidence of a negative Coggins test for every horse entering the event; this safeguard will prevent disease introduction and spread. Separate healthy horses from those horses who have fevers, reduced feed intake, and/or have lethargy. Call your veterinarian. Copyright © 2019 | Horse-Fly-Trap.com. | All Rights Reserved.